Release date: October 2016 worldwide. Pre-orders opening tomorrow (March 16th). Camera and Move is separate. Star Wars Battlefront exclusive PSVR title developed by EA DICE coming. Launch games include RIGS: Mechanized Combat League, BattleZone and many (in the tens) more. Play standard PS4 games and videos in virtual cinema. 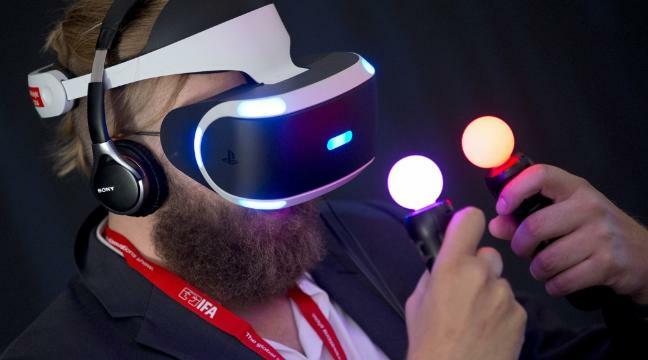 PS4 OS available in VR so full end-to-end service. 1920 x RGB x 1080 screen. My aim was so off on that. I so expected a standalone version and much cheaper. Even still, with the support of PS4 games, too, which i didn't expect, i think its easily justified. I was sold either way, but it'll probably be a little difficult for those without the expenses to spare, though. 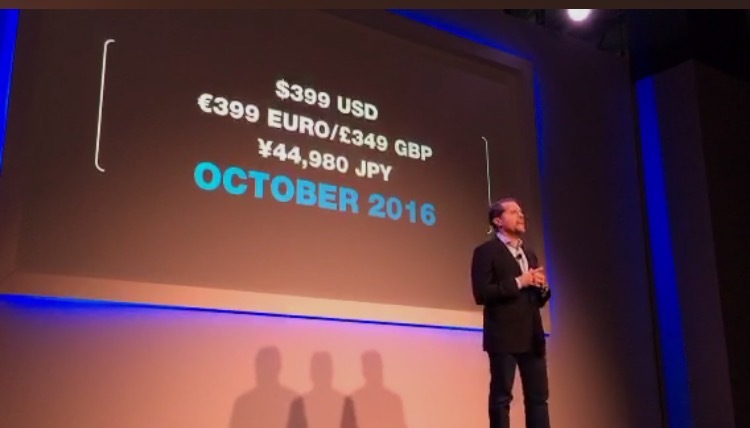 Then again, it is the price of the PS4 when it launched, so maybe not. So it's closer to $500 if you want the "full" PSVR experience then? Wouldn't this be the standalone version? It comes with nothing but the "bare essentials"? They surely must also offer a second more expensive bundle with the PS Camera??? I would call it the 'This one has the camera you actually need for it to function if you don't already own the camera you need for it to function PlayStation VR ULTRA BUNDLE'. The basic standalone version I would name 'This one doesn't come with the camera you actually need for it to function but LOOK AT THAT BELOW $400 STICKER PRICE, FAM, PlayStation VR you already own the camera edition'. I should totally work in marketing. $400 and no ps camera included. This is totally par for the course. Well it comes with a game and ear buds, cheap ones, I'll albeit. But like i said, the good news is that it supports your entire PS4 collection. So unlike a usual peripheral, its not likely to go to waste since it has a lot of support. So that's great for those needing to justify it's worth. Looks like I nailed it with my guess. Shawn Jelsic...um, err, ahhh....no. Time for you to start listening to some of our posts instead of constantly cutting them down all the time. You don't know it all buddy as the pricing of this shows you were CLEARLY wrong. Ahh, find that funny, huh Shawn? Be a man you twit. Dude, he did own up and say he was wrong and apologized in the previous thread. Yeah I have no problem with Shawns guess. I was hoping it was going to be $299 too. As of now the price puts it pretty close to Occulus if you don't own any of the accessories. Which I don't. And I'm assuming a lot of other PS4 owners don't also. I'll probably wait for a price drop or some killer apps. About what I expected tbh. High quality VR is not going to be cheap but it will be worth it. Also cut Shawn a bit of slack guys. I'd call that standalone, it lacks the camera and Move controllers. They'd never sell it without software (just about every peripheral comes with some sort of cursory software) especially something as exciting as VR. Sweet. Did you see those cables? And people were mad about an external power brick. It was sooo going to be $250, if it weren't for OC and Vive announcing higher price points! For someone just diving in, though, that can be a pretty good hit if they don't have the funds. Hopefully, those interested have the camera available or can get one for very cheap. When you think about it, though, its about equivalent to purchasing a second console. Perhaps that is where the upside is a bit if a positive. Yup, so about the price of a console. That's what i expected. Anything more and PS VR had no chance. I can see it taking off at $399 just because it's something new. How long the hype will last is anyone's guess though. Camera is required for PSVR to function but is not bundled with the system. Therefore it it's not standalone because additional hardware is required for the headset to work. If they guaranteed it would last for all of next Gen, it would be a lot more inviting. I read that Pachter said, if the price is $500 or below, Sony can grab a big chunk of the VR market. Pachter! It must be true. But they did price it competitively. They also set expectations beforehand ("similar in price to a new console platform," which most people not named Shawn assumed meant about $399), so no one was surprised or sticker-shocked. Moreover, you had Oculus and Vive announcing at much higher prices ($600 and $800, respectively) just beforehand, so by comparison, $400 sounds much more palatable. They also did not make the mistake of pricing it too low, cutting their margins and leaving themselves little room to drop the price over time. Well played. I hate golf... But when you're a 100ft Robot! That sounds like possibly the greatest game ever! If they can include bullet time, and break dancing cheerleaders, throw in a cameo or two from the Real Housewives of Beverly hills, and we have a perfect game! I wonder if the golf ball is a normal sized one, and you're a giant robot having to hit this tiny spec! VR will add soooo much to this!!! Well, $450 if you don't own the camera. $500 if you want to look like this guy. So what kind of hollow apology is it when he is laughing it off in this thread? Man up, Jelsic. You are NOT the voice of knowledge, you have tried non-stop to minimize others opinions on VR and you were wrong in a BIG way. Eat your humble pie and join the rest of us in guessing what will happen, we may get it wrong but we aren't going to squash others because their opinions are different from our own. You have a lot to learn son and it's time to understand why the good Lord gave you 2 ears and only 1 mouth. Camera is only $50? Still way too much for my liking. Or I'll get into my stupid mood of "omfg I need new technology now!!!" Those headphones are gonna run ya a few bucks too! much they'll price it over this unit. I might be down to get this if they have some decent games, most everything I've seen looks average or below. I don't like that they are advertising this at a price assuming everyone has the camera just to push the $399 number. Very shady.